The seven walking and hiking trails in Crikvenica, Dramalj, Jadranovo, Selce, Novi Vinodolski and Vinodol offer extraordinary sights and a special atmosphere. The trails run along the coast, through a pine forest right by the sea, or through the green hinterland across attractive forests, fields, mountain tops, cliffs and ridges. The Waves Trail leads from Povile to Jadranovo. Even though it partly runs next to an inhabited area, you can still see areas of unspoilt nature, such as the holm oak forest in the Dumboka area, and the steep cliffs of Takla and Dumboka. The total length of the trail is 30 km. A part of the Waves Trail leads along the coast, mostly next to the towns and villages of Povile, Novi Vinodolski, Selce, Crikvenica, Dramalj and Jadranovo. Another part of the Waves Trail leads through the uninhabited area from the Novi Spa Hotels & Resort in Novi Vinodolski to Slana Cove in Selce, and from the peninsula of Kačjak in Dramalj to Perhat in Jadranovo. The trail is marked only in these areas. The Karst and Sage Trail starts in Novi Vinodolski and leads to Orljak Pass (260 metres above sea level) between Jadranovo and Drivenik. 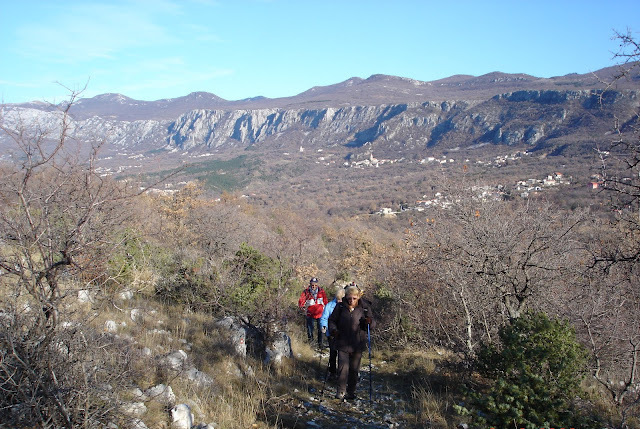 This trail offers beautiful views of the coast, Kvarner islands, Velebit and Učka mountains, the lake in Tribalj, and the forts in Drivenik and Grižane. It leads past Badanj Fort, the chapels of St. Cosmas and St. Barbara, and the Church of St. George. The total length of the trail is 28 km. For the most part, the Karst and Sage Trail leads along a low hilly ridge with an average altitude of 300 metres which separates the Vinodol valley from the sea. The ridge is steep towards the Vinodol valley, but gentler on the side facing the sea. In the area of Crikvenica, the ridge is bisected by the Dubračina stream. 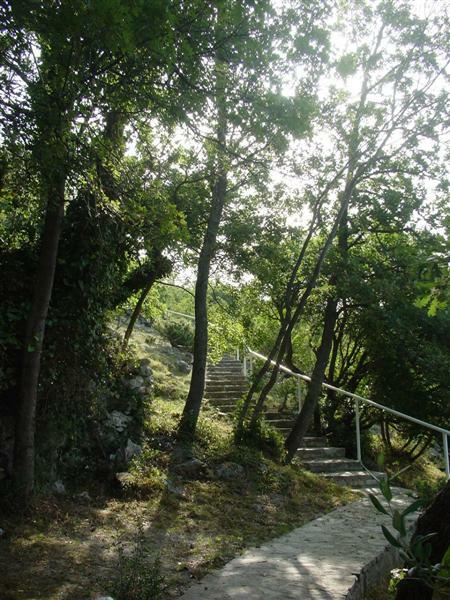 The Cliff Trail leads from the Vinište mountain hut at an altitude of 300 metres to the grassy Zebar hilltop in the area of Uhanj at an altitude of 748 metres just above the village of Drivenik. 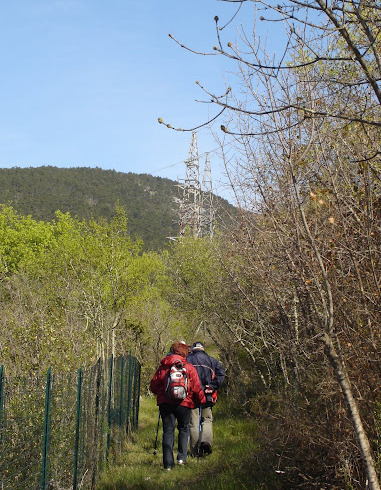 The trail leads through a variety of landscapes ranging from rocky ground to littoral thickets and mountain meadows, which makes walking along it particularly dynamic and interesting. The total length of the trail is 29 km. The trail includes the steep rocky cliffs above the Vinodol valley. The first part of the trail leads along the lower part of the littoral ridge above Klenovica and Povile, while after the village of Zagon, the trail starts to ascend alongside the steep cliffs above Vinodol. When hiking along the Cliff Trail, you can visit the peak of Gradina at an altitude of 379 metres, the vantage points of Kameni Križ (Stone Cross), Kacalj, Klamaruša and Slipica, the well-tended Pridva viewpoint, the mountain meadows of Njivine and Zebar, and the Kozak stone massif (669 metres above sea level). Ledenice Fort, which played a crucial role in the defence against the Turks until the end of the 17th century, is a prominent landmark on the Cliff Trail. 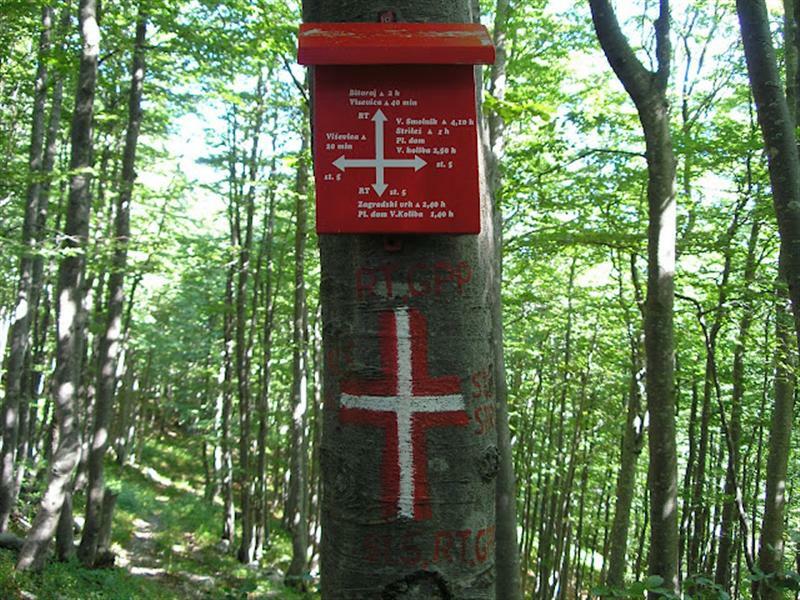 The Green Trail starts at Luka Krmpotska, next to the hunting lodge, at an altitude of 750 metres and ends at the peak of Medviđak at an altitude of 1,027 metres. At the very beginning of your hike, don't miss the Glass Chapel (Staklena kapelica) located in the immediate vicinity of the hunting lodge. The total length of the trail is 45 km. The Green Trail runs past the mountain meadows on the southern slopes of Ričičko Bilo, Rujnik and Sitovnik, and the peaks of Rujnik (1,042 m), Sitovnik (1,048 m), Zagradski Vrh (1,187 m), Kanculova Glava (1,120 m), and Medviđak (1,027 m). 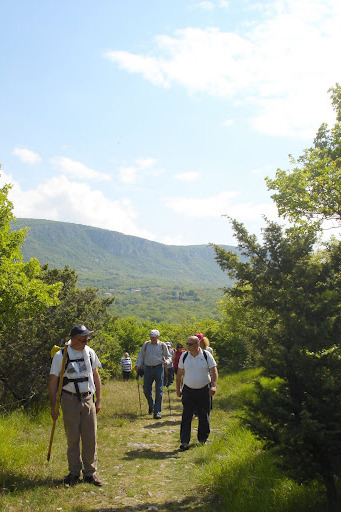 The first part of the trail leads through beautiful mountain meadows which offer stunning views of the sea, the islands of Kvarner Bay, and Mount Velebit on one side, and the highest mountain peaks in this area (Ričičko Bilo, Strilež, and Viševica) on the other. After Sitovnik, the trail leads through forest areas which are interspersed with the scenic meadows of Okrugli, Ravni, Laz and Suha. Just like the Green Trail, the Heavenly Trail also starts in Luka Krmpotska next to the hunters lodge at an altitude of 750 metres. 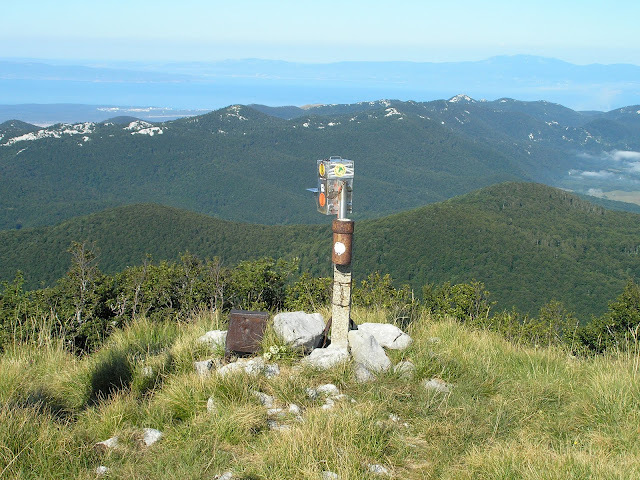 It ends at the peak of Medviđak at an altitude of 1,027 metres. The total length of the trail is 53.7 km. The Heavenly Trail's name comes from the fact that it encompasses the highest peaks of the area, from which one can almost 'touch the sky'. These peaks are: Crni Vrh (1,169 m), Ričičko Bilo (1,286 m), Veliki Smolnik (1,279 m), Strilež (1,381 m), Viševica (1,428 m), Zagradski Vrh (1,187 m), Veliki Kobiljak (1,112 m), and Medviđak (1,027 m). Further north from the mountain peaks, there are vast expanses of beech and spruce forest with the scenic mountain plateaus of Kolevratsko Polje, Petnja, Crni Kal, Maševo, Lukovo, Ravno and Ličko Polje in their foothills. We recommend visiting the peaks of Viševica and Ričičko Bilo, the small church of Maša, the stone peak of Strmeljevo, and the area of Banska Stolica, which is famous for its three large rocks that resemble heads. The Roman Trail starts in Crikvenica next to the Town Sports Hall. For the most part, it follows the Dubračina stream all the way to the spring near the village of Čandrli right after Drivenik. The total length of the trail is 15 km. 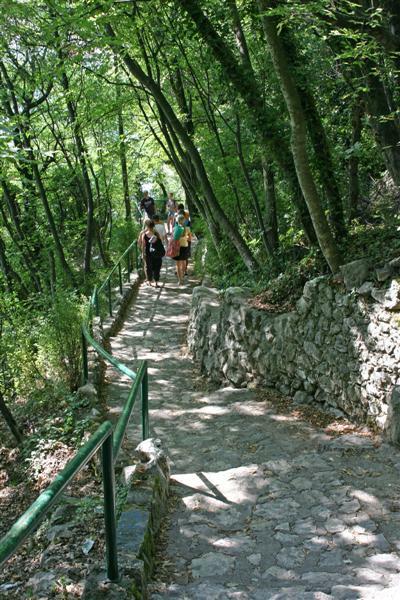 The Roman Trail got its name due to the fact that during the Roman period a road connecting Tarsatica (Trsat in Rijeka) and Senia (Senj) passed alongside the stream. 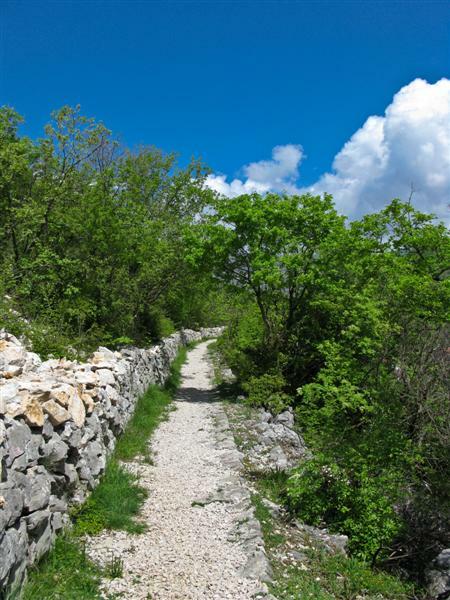 The preserved part of the Roman road, the ruins of the Chapel of the Holy Spirit from the 14th century, the Old Croatian cemetery of Stranče, the mills in the village of Cerovići, and the fort in Drivenik should not be missed. The Degenia Trail leads from the coastal village of Sibinj to the campsite in Kozica. 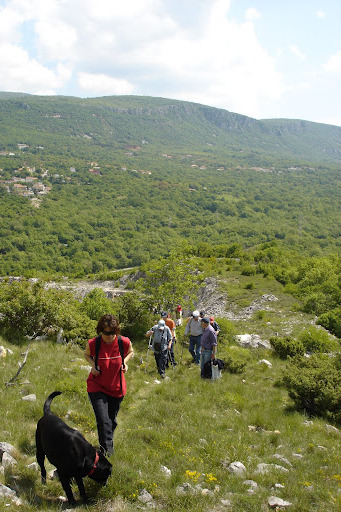 It was named after Degenia Velebitica, an endemic plant which was formerly believed to grow only on Mount Velebit. The total length of the trail is 10 km. The Degenia Trail encompasses two canyon-type valleys among the hills of Veliki vrh (512 m), Osredak (502 m), and Vrataruša (510 m). The trail also passes through Vodna Draga, and goes around Tomiška Draga along its northern and western rocky edges at an altitude of 400 to 500 metres.